user-generated Headlines and reports on this page = 3 news items. Page - 2. 'BARK In The Park' arrives at Victoria Park, on the 24 September 2017, as Merseyside Dogs Home and Natural Instinct celebrate everything dogs and raise money for Merseyside Dogs Home. This year Merseyside Dogs Home and Natural Instinct have a number of exciting new features as well as improving attractions from previous years. Both Merseyside Dogs Home and Natural Instinct will be joined by over 75 shops offering everything the North West has to offer your pooch. On the day there is the opportunity to see if your dog is up to the cut and see if they can earn their kennel club good citizen award. \the event will have a range of fun activates to have a go at and collect points to go towards the Have A Go Championship, plus our fun agility course with see saws, jumps, hoops and tunnels! Merseyside Dogs Home and Natural Instinct top dog tent will play host to a range of experts in their respective fields. Join them and learn about dog training, cai9 wellbeing and nutrition. New for 2017; Meet The Dogs! our jam packed area has dozens of exotic dog breeds from all over the world waiting to be stroked! Not to mention appearances from Merseyside Police Dog Cilla and the Merseyside Dogs Home assistance Dogs. For the 1st time ever we have secure camping facilities so you can bunk up the night before with your best friend and enjoy the entertainment; tickets must be purchased in advance. The main area will have a jam packed schedule throughout the whole day with a variety of displays from a whole range of acts! Grab your popcorn and your seat and be ready to be amazed. Of course the fun dog show is back, this year over 3 rings we have nearly 30 categories to enter your best friend into to see if they will be crowned Best In Show at the end of the day! Both Merseyside Dogs Home and Natural Instinct look forward to seeing you at Victoria Park Southport! The Merseyside Dogs Home Team, Interested in volunteering? Have any questions? or Interested in exhibiting? If yes to all or just 1 of those questions send an email to:- Events@MerseysideDogsHome.Org for more information! UK farmers and landowners along main river banks could find themselves being sued whenever a neighbouring property floods unless there are changes to the Government's Water Bill says the CLA in the North. The Association says that the Bill as it is currently drafted could leave owners exposed to claims for damage and nuisance through no fault of their own. CLA North Regional Director of Policy and Public Affairs Douglas Chalmers said:- "This is an unintended and unfair consequence of the Bill and the Government must take this opportunity to put it right. The Environment Agency is dealing with reduced budgets by withdrawing from long standing flood defence commitments, effectively passing on the cost and responsibility to farmers and landowners, who could then face legal claims from the owners of adjoining properties in the event of flooding." The CLA is also concerned that home owners in areas where flood defences are being withdrawn may have their properties classified as at:- "serious risk of flooding," which would adversely affect their insurance and property value. Mr Chalmers added:- "We don't believe that that Government foresaw this development of common law which disproportionately affects farmers and landowners whose land happens to lie along the course of a river." The CLA is calling on the Government to include a new clause in the Bill to limit the liability in private nuisance for a riparian owner when the Environment Agency or relevant authority withdraws from maintaining flood defences. THE Red Shed is the 3rd part of our favourite campaigning comic's theatrical trilogy, following the much revered Bravo Figaro and Cuckooed. 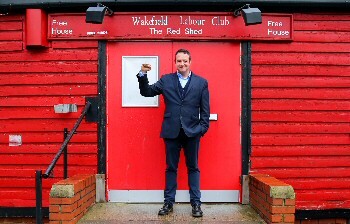 Mark returns to the place where it all began; the Red Shed, a labour club in Wakefield; to celebrate the club's 50th Birthday as he concludes this tour of his award winning, highly acclaimed performance. The Shed, home to Mark's 1st public performances, is also a home to dissent, to organising and to progressive politics, and so it was here that Mark's true political prowess began. An iconic and vital place for its patrons, this is where the true meaning of solidarity is found and where you can be part of history and part of the struggle. A south London lad, born to a Thatcherite world of self employed builders, labourers and tradesman like his father where the individual is key, Wakefield's alien traditional labour community awoke a new determination in Mark and changed his life forever. Interviewing old friends and comrades, Mark pieces together the club's history and works alongside it to campaign with some of the poorest workers in the country. It is the story of the battle for hope and the survival of a community. It is a tale of :-strikes, fights, dinner ladies, crap beer, good beer, burger slingers, pickets, placards, commies, friendship, love, history, dreams and, above all, remembering. Part theatre, part stand up, part journalism, part activism, Mark realises his obsession with community and struggle. ► Tuesday, 19 September 2017 - READING, South Street:- 0118 937 3456. ► Wednesday, 20 September 2017 - Southport, The Atkinson:- 01704 533 333. ► Friday, 22 September 2017 - GOOLE, Junction:- 01405 763652. ► Saturday, 23 September 2017 - WAKEFIELD, Theatre Royal:- 01924 211311.